The BEA's preliminary estimate is that real GDP grew at a 3.5% annual rate in the third quarter (July - Sept.). 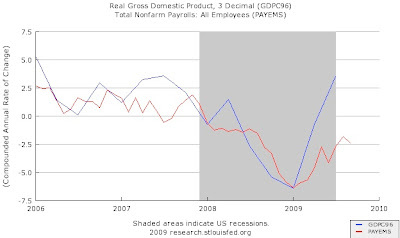 At some point in the future, the NBER will call the business cycle trough retrospectively, but it looks like, once they do, we will say that we emerged from the shaded area in mid-2009: However, the red line indicates continuing violation of "Okun's law," the rule of thumb which implies that 3.5% growth should give us rising employment (the unemployment rate increased from 9.5% in June to 9.8% in September). Real federal government consumption expenditures and gross investment increased 7.9 percent in the third quarter, compared with an increase of 11.4 percent in the second. National defense increased 8.4 percent, compared with an increase of 14.0 percent. Nondefense increased 6.8 percent, compared with an increase of 6.1 percent. The change in real private inventories added 0.94 percentage point to the third-quarter change in real GDP after subtracting 1.42 percentage points from the second-quarter change... Real final sales of domestic product -- GDP less change in private inventories -- increased 2.5 percent in the third quarter, compared with an increase of 0.7 percent in the second. A hopeful sign is that investment in equipment and software increased, but ever so slightly (1.1%). A decrease in investment in nonresidential structures led to an overall negative number for nonresidential fixed investment. The "rebalancing" of the economy took a pause: exports grew (14.7%), but imports grew still faster (16.2%). Also, state and local government expenditures fell 1.1%; a further indication that states' inability to run deficits is acting as a counter-stimulus (Washington: send more money). Overall, while the headline number suggests we're moving out of the shade, it is hard to say we've really emerged into the light until we see businesses confident enough to invest more robustly and hire workers as well as less reliance on federal efforts to prop up demand. For more, see the Times story, and the roundup of "economist" reactions at Economix. Update: Oops. I misinterpreted what was going on with inventories. Inventories continued to decline, but at a decreasing rate, hence the positive contribution to GDP growth (inventories declined by $130.8 bn in Q3, vs. $160.2 bn in Q2). That actually makes the picture look a bit better for the future as it means firms are not piling up inventories, which might lead them to cut back production. Free Exchange has thoughts from Robert Gordon and Real Time Economics has more "economist" reaction. If you want to understand how to fix today's health insurance system, you'd be smart to look first at how it was born. How did Americans end up with a system in which employers pay for our health insurance? My Miami colleague Melissa Thomasson answers. After allowing a limited appreciation of the yuan from mid-2005 to mid-2008, China has tied its currency tightly to the dollar over the past year. Although there has been a lot of doomsaying about the falling dollar, that decline is actually both natural and desirable. America needs a weaker dollar to help reduce its trade deficit, and it’s getting that weaker dollar as nervous investors, who flocked into the presumed safety of U.S. debt at the peak of the crisis, have started putting their money to work elsewhere. But China has been keeping its currency pegged to the dollar — which means that a country with a huge trade surplus and a rapidly recovering economy, a country whose currency should be rising in value, is in effect engineering a large devaluation instead. And that’s a particularly bad thing to do at a time when the world economy remains deeply depressed due to inadequate overall demand. By pursuing a weak-currency policy, China is siphoning some of that inadequate demand away from other nations, which is hurting growth almost everywhere. The biggest victims, by the way, are probably workers in other poor countries. In normal times, I’d be among the first to reject claims that China is stealing other peoples’ jobs, but right now it’s the simple truth. [T]he United States is not the country that's hurt the most by this tactic. It's the rest of the world -- articularly Europe and the Pacific Rim -- that are getting royally screwed by China's policy. These countries are seeing their currencies appreciating against both the dollar and the renminbi, which means they're products are less competitive in the U.S. market compared to domestic production and Chinese exports. 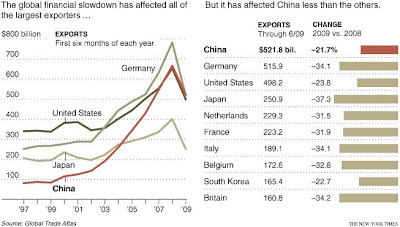 What concerns European policymakers most is the lockstep rise against China's yuan. Beijing has clamped the yuan firmly to the weak dollar for over a year, quietly benefiting from the export advantages. It accumulated $68bn (£41bn) in reserves in September alone as a side-effect of holding down the currency. Fresh reserves are mostly being invested in eurozone bonds, pushing the euro higher. French finance minister Christine Lagarde said it was intolerable that Europe should "pay the price" for a dysfunctional link between the US and China. "We want a strong dollar, and we have reiterated it again in the strongest manner," she said after this week's Eurogroup meeting. China's trade surplus with the EU reached €169bn (£154bn) last year. 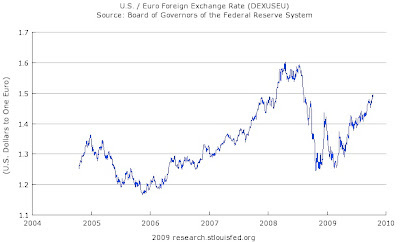 A recent Times story on the benefit to US exporters from the falling dollar also notes the pain in Europe, and Willem Buiter blames the ECB for overly-restrictive policies. 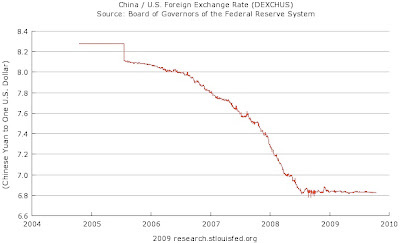 Also, Krugman explains the "yuan" / "renminbi" thing. Nearly half (49 percent) of recipients reported using the rebate mostly to pay off debt. Most other recipients reported either mostly spending the rebate (30 percent), or mostly saving the rebate (18 percent)... Although there is some variation, this pattern also generally holds true across income groups. That last part surprised me. Like many other stimulus proponents, I expected that lower income households would spend more of the money, and, therefore, funds targeted at them would be more effective stimulus. That is, in the language of the textbook Keynesian model, the marginal propensity to consume would be higher at lower incomes. The survey results suggest otherwise. However, because the benefit phased out at with income, we don't know whether the truly rich would have behaved differently (the top category in the data is households with incomes over $70,000). One effect of income taxes is to alter the incentives to work and save. Because income taxes change people's behavior - in theory, at least - they are said to "distortionary." What matters here is not the amount of taxation, but rather the marginal tax rate - e.g., a worker facing a 30% marginal tax rate will take home $70 for each additional $100 earned, so the tax reduces the benefit of working more (and decreases the cost of working less) by 30%. 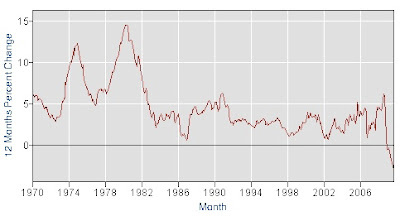 One of the central premises of the "supply side economics" that motivated the Reagan administration is that lower marginal tax rates would lead to an increase in work and investment (i.e., more "aggregate supply"). Many tax preferences are phased in or out according to income, and as a result, those who earn extra income may face either a hidden tax or a subsidy as their tax benefits change in value. For example, for those in the phase-in range of the earned income credit earning an extra dollar increases the credit and reduces their tax liability, driving their actual rate below their statutory rate. But once they make enough so the EITC begins to phase out, the opposite happens and the rate they actually pay climbs. Yet many don’t even know it. Statutory and effective rates differ so haphazardly that most taxpayers probably have no idea how much tax they owe on an additional dollar of income. What does this say about our current tax system? First, the phase-in and phase-outs of provisions really do bite. Second, in case you needed more proof that our current system is complex, here you have it. Finally, it suggests that many individuals are making decisions based on incorrect notions about the tax consequences of their behavior. Not only does this remind us what a mess the tax code is, it also raises the question of how much we can depend on assuming that the incentive effects of taxes significantly alter behavior, if people cannot even determine what those incentives are. Social security payments rise automatically with inflation through a mechanism known as the cost of living adjustment (COLA). The adjustment is asymmetric - social security payments adjust upward for inflation, but not downward with deflation. This year, the index that the COLA is based on - the CPI for urban wage earners and clerical workers in the 3rd quarter - was 2.1% lower than a year ago, which implies that there should be a COLA of zero. Although deflation is generally bad news for the economy as a whole, one group that benefits are those who have fixed nominal incomes. Since prices have fallen over all, a given dollar income has greater purchasing power. That is, the real value of social security payments would rise, even if the nominal level (i.e., the dollar amount) stayed constant. But that's apparently not good enough: through some confluence of money illusion, pandering and self-interest, the zero COLA has come to be viewed as unfair to seniors. The administration is proposing to add an artificial sweetener in the form of a $250 extra payment to social security recipients. Normally, that's not very good policy - EconomistMom, for one, is not happy - but as Ezra Klein points out: "The economy needs more stimulus and this is good stimulus." Potentially, a bad precedent. But hopefully we won't see deflation again. [P]erhaps the most persistent — and thought-provoking — conservative critic of the party has been Bruce Bartlett. Mr. Bartlett has worked for Jack Kemp and Presidents Reagan and George H. W. Bush. He has been a fellow at the Cato Institute and the Heritage Foundation. He wants the estate tax to be reduced, and he thinks that President Obama should not have taken on health reform or climate change this year. On the spending side, Republican leaders criticize Mr. Obama, yet offer no serious spending cuts of their own. Indeed, when the White House has proposed cuts — to parts of Medicare, to an outdated fighter jet program and to subsidies for banks and agribusiness — most Republicans have opposed them. How, Mr. Bartlett asks, is this conservative? How is it in keeping with a party that once prided itself on fiscal responsibility — the party of President Dwight Eisenhower (who refused to cut taxes because the budget wasn’t balanced) or of the first President Bush (whose tax increase helped create the 1990s surpluses)? Everyone knows that fiscal discipline must be restored eventually, or we will face truly horrifying consequences--defaulting on the debt, nonpayment of Social Security benefits, a collapsing dollar, and double-digit inflation and interest rates. Everyone also knows that this will involve a combination of higher revenues and lower spending. The idea that we can restore fiscal health only with spending cuts is childish, as I tried to explain last week. While there is some truth in his argument that the contemporary Republican anti-tax reflex is pretty far removed from the "supply side" principles of the Kemp-Roth bill (see, e.g., this post at Capital Gains and Games), it is a bit ironic to see an original Reagan revolutionary sounding like such an Eisenhower Republican (or Clinton/Rubin Democrat). EconomistMom likes what he's saying. Update (10/16): Bartlett explains his thinking further in a blog post "Supply Side Economics, RIP." Marginal Revolution picks up my favorite quotation. [T]he administration’s own economic projection — a projection that takes into account the extra jobs the administration says its policies will create — is that the unemployment rate, which was below 5 percent just two years ago, will average 9.8 percent in 2010, 8.6 percent in 2011, and 7.7 percent in 2012. This should not be considered an acceptable outlook. For one thing, it implies an enormous amount of suffering over the next few years. 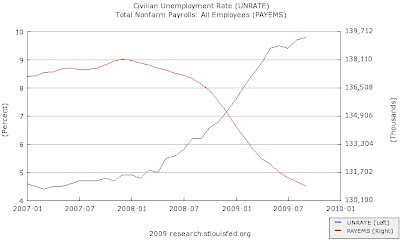 Moreover, unemployment that remains that high, that long, will cast long shadows over America’s future.